By coincidence, an acquaintance of ours happened to own a book called “The Australian Braford”, which was published by the Australian Braford Society to commemorate the Silver Jubilee of the breed in 1987. The book details all the early stud breeders and, more importantly, the origins of the breed itself. I found it absolutely fascinating to find out the origins of the breed and the historical context. Around the 1820s the first British cattle breeds were imported to Australia from England(until then the only cattle available were a mixed herd descending from those cattle on the first fleet). At this time Herefords and Shorthorns were particularly popular. Such was the influence of “the old country” that the cattlemen persevered with these breeds, even though they were not particularly well suited to the Australian climate and vegetation. They even judged the show cattle to British standards. At the time, the Bos Indicus cattle, originating in India, were thought to have unsuitable temperament and not put on enough weight to be used as commercial beef breeds. It seems hard to imagine now that we are so used to seeing Brahman and the Brahman-derived breeds, such as Droughtmasters, on properties across Northern Australian. To me this shows how conservative farming practices were back then, with little innovation, possibly due to the potential cost of failure and lack of information available to farmers. I was absolutely fascinated to read about the first Braford breeding program conducted by Adam Rea of Eden Garry, and the dedication and patience required to develop a breed that would prosper under the conditions at his property. This made me think that he probably kept better records than my occasional garden journal entries! The book goes on to explain how Mr Rea eventually started to select for colouring to develop the red and white Braford that we know today. The society wasn’t formed until 1962, which is testament to the amount of work required to develop the Braford breed. The unique aspect of the Braford (and some other Australian breeds, like the Murray Grey), is that they were developed to suit their environment and the breed has always been allowed to be three-eighths to five eighths Brahman, depending on the environment in which they live, rather than having a uniform look, as many of the British and European breeds require. This is very important in the diverse climate of Australia, where no one breed will do well in every area. As for their appearance, Brafords are (obviously) a bit of Brahman and a bit of Hereford. 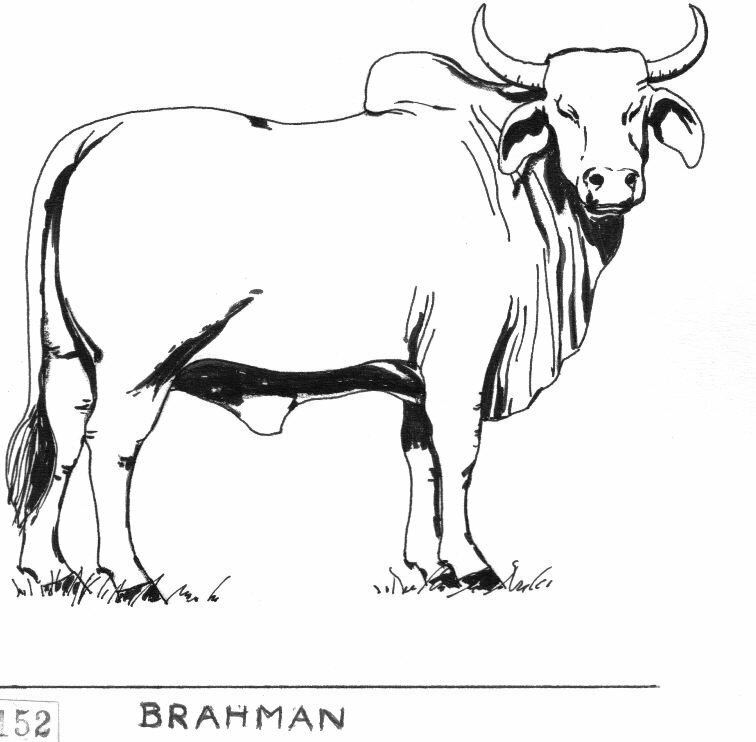 Like the Brahman, the Braford has a distinct hump over the top of the shoulder and neck (although usually not so large in the Braford), and a loose flap of skin (dewlap) hanging from the neck and under their bellies, they also have distinctive long, floppy ears. From the Hereford breed, the Brafords derive their red and white colouring. They usually have a red body, with a white face. Breeders aim for red pigmentation around the eyes to reduce eye cancer. The Braford does not have the thick Hereford coat, even in winter they maintain a short coat like the Brahman. 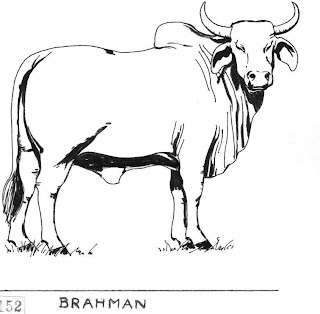 While Herefordcattle can be bred to be consistently polled (no horns) the combination of Brahman and Herefordgenes has complicated the establishment of consistently polled Braford cattle. The standard in Australia is to remove horns if the animal is not born polled. This is for aesthetics, safety and to prevent bruising the meat (I’ll discuss dehorning in more detail in a later post). After the Brafords became established in the warmer climate of Queensland, there was some interest in the breed further south in New South Wales as well. In this case, the farmers were more interested in the natural resistance to eye cancer, rather than the heat and tick tolerance that had proved important in QLD. They don’t seem to have gained any popularity in the more southern states however, I assume this is because the British and European breeds do well in those climates. Even more interesting is the concurrent development of the Braford breed in America in the late 1940s. In this case the Brahman cattle were more available and the breed was developed from Brahman cows and a Hereford Bull in Florida, where the British breeds were also suffering under hot conditions. In both cases, the Braford genetics were created out of necessity and with the aim of developing a breed that would thrive in a warm climate. “Bill! Try a Braford bull”. “Don’t take me for a sucker”. Your bull looks pretty well”. But Bill’s were in a mess. For most of mine are dead”. It’s Brafords now for me”. Is the bull who jumped the fence.